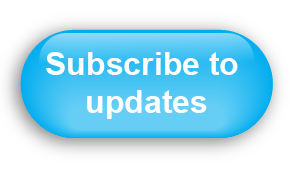 The CMLTO will continue to provide information via electronic updates to all who register for them. The CMLTO's Voluntary Roster criteria was updated by Council at their November 2017 meeting, effective April 1, 2018. Click here for further information. Search the Voluntary Roster by clicking here. Read the report about this initiative included in the 2015 CMLTO Annual Report by clicking here (PDF). 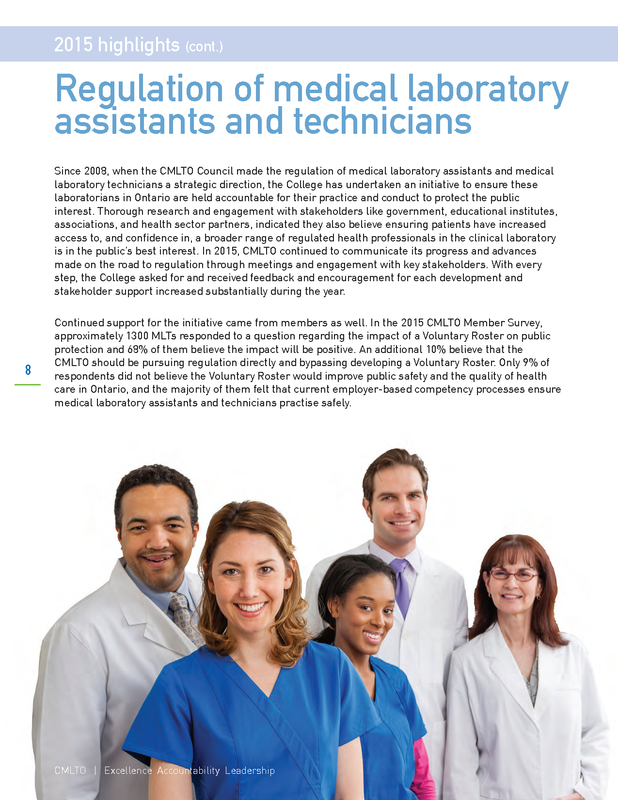 CMLTO stakeholder publishes article in support of regulating medical laboratory assistants and technicians. The Canadian Society for Medical Laboratory Science(CSMLS) published an article by its President Chris Hirtle, which outlines CSMLS' support for regulating medical laboratory assistants and technicians. In particular, he cites CMLTO's efforts and the Voluntary Roster of Registered Medical Laboratory Technicians while refuting some misconceptions about the initiative. The regulation of medical laboratory assistants and medical laboratory technicians is a multi-year initiative. Key milestones are documented in the project timeline. Medical laboratory assistants and medical laboratory technicians have a significant impact on quality patient care, and that impact is increasing. Regulating medical laboratory assistants and medical laboratory technicians under the same legislative framework as medical laboratory technologists will provide the public with greater protection through the assurance of high-quality clinical laboratory services. Discussions with medical laboratory technologists, assistants and technicians have clarified and confirmed the CMLTO's rationale for pursuing the regulation of medical laboratory assistants and medical laboratory technicians, which is articulated the CMLTO's Position Paper. Medical laboratory assistants and medical laboratory technicians have diverse educational and preparatory backgrounds as they come into the clinical laboratory. A scope of practice statement for medical laboratory assistants and technicians is a foundational and fundamental part of the regulation of medical laboratory assistants and medical laboratory technicians as it outlines the scope of responsibilities of those practitioners the CMLTO is addressing. The CMLTO developed the Standards of Practice for Registered Medical Laboratory Technicians to define the expectations and professional accountabilities for individuals included in the CMLTO Voluntary Roster. The Standards of Practice apply to all dimensions of practice, including non-technical areas such as education, administration, quality assurance and research. The Code of Ethics outlines the expectations for professional behaviours by Registered Medical Laboratory Technicians included on the College of Medical Laboratory Technologists of Ontario (CMLTO) Voluntary Roster. 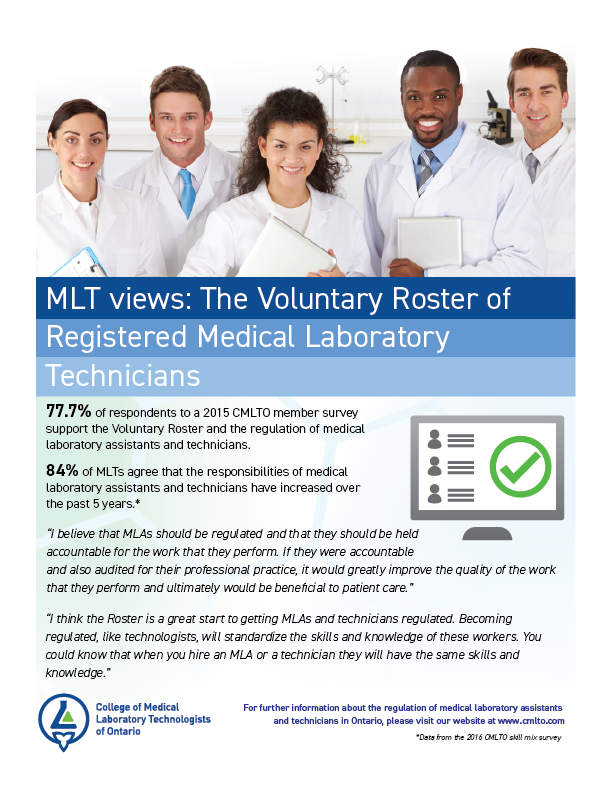 These statements provide a moral framework for the professional and personal conduct of all Registered Medical Laboratory Technicians included on the CMLTO Voluntary Roster. The Code of Ethics applies to all dimensions of practice, including non-technical areas such as education, administration, quality assurance and research.